The Canadian province of Quebec seems like it was made for camping as it’s ideal for tents, trailers, and recreational vehicles. The province is home to thousands of official campgrounds. These can be found lying by lakesides, hidden in the woods, alongside rivers, and on sandy beaches. The campgrounds offer a variety of amenities, activities, and attractions and are as close to nature as you can get. 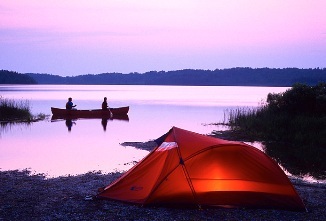 One of the most popular activities in Quebec is canoe camping as it allows you to enter the heart of Mother Nature. You can enjoy paddling down peaceful rivers, bubbling rapids, and crystal-clear lakes. Many national and regional parks and wildlife reserves provide rustic waterside campsites by rivers and lakes, and rent canoes. There are also many agencies that deal in adventure tourism if you’d rather go on a supervised trip. If you’d rather camp in your recreational vehicle there are hundreds of campgrounds in Quebec with you in mind. If you’d like to enjoy the experience with other RV campers there are quite a few organized tours designed for you. The fun doesn’t have to end when the snow hits either as you can still enjoy many campgrounds and national parks between October and May. Just make sure you take the proper equipment with you for winter camping. Group expeditions are provided by several companies during the winter that will give you a glimpse of the life that the early settlers lived. You can even camp out in a tepee or an igloo.